Who remembers growing up eating Sloppy Joes out of a can? My, how much we have evolved from dinners in the 70’s and 80’s. While we loved the convenience of pre packaged frozen and canned foods, we had no idea the health consequences of what we were eating. But boy, there was nothing more fun than trying to eat a messy fall off the bun sloppy joe. Am I right? As my food habits have changed, I became obsessed with Sloppy Joes again when I found a box of Vegetarian Sloppy Joe mix from Fantastic Foods at Whole Foods. Not only is it incredibly easy (just add tomato sauce!) it is delicious. I vow to never walk out of Whole Foods without a box of this stuff again. I vow to never be without a box or two in my pantry at any given time. It’s just that good. Except that now, it has become nearly impossible to find. Whole Foods does not carry it regularly anymore and it has been in an unavailable state on Amazon for a year now. Occasionally, I will find a small supply at my local Publix and I will stock up. (I am sorry for my fellow Publix shoppers as I basically confiscate the entire supply) However, as wonderful the Fantastic Foods boxed Sloppy Joe is, it is still just that- a BOX of food. 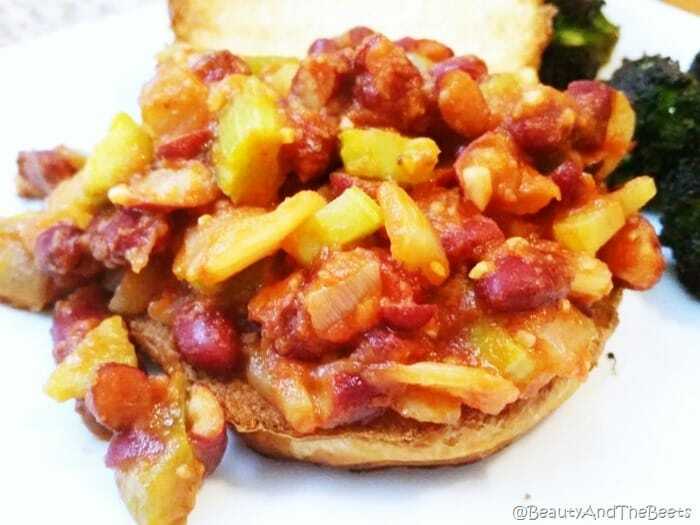 I have been searching high and low for a tasty yet simple recipe for a Vegan Sloppy Joe. I finally decided to try my hand at making my own. Mr. Beet and I both loved this version of a Vegan Sloppy Joe though it was a bit on the sweet side. I used a tomato paste without added sugar, and if you want it less sweet, just use half the amount of brown sugar, or even cut it out of the recipe entirely. I also cheat and buy the pre-diced peppers, onions, and celery mix at Publix. 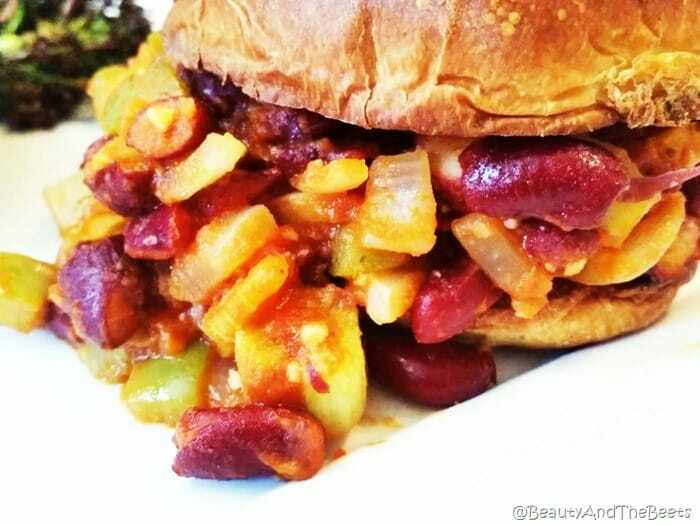 I also think adding soy crumbles or lentils to the recipe would add an even more authentic Sloppy Joe texture and flavor to this dish. The beauty of cooking with veggies really is the versatility of the recipes. It is pretty simple to substitute most veggies with one another and still have the dish be delicious. I have a great recipe for Cauliflower-Walnut Meatless crumbles – just add the baked crumbles into the mix just before serving. The recipe made more than enough for six servings. The next day for lunch I topped white rice with the leftover Sloppy Joe mix and served with a small Spinach side salad. Still delicious the second time around. 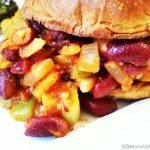 The sloppy joe recipe is also Vegan!! Heat the oil in a large skillet then add the onion, celery, green pepper, and garlic. Sautee until ingredients are softened, about 5 minutes. Add the tomato paste and continue to stir over medium heat for 3 minutes. Add the brown sugar, vinegar, mustard, celery seed, and salt. Continue to stir until ingredients are well blended. Slowly add the water and fold in the red kidney beans. 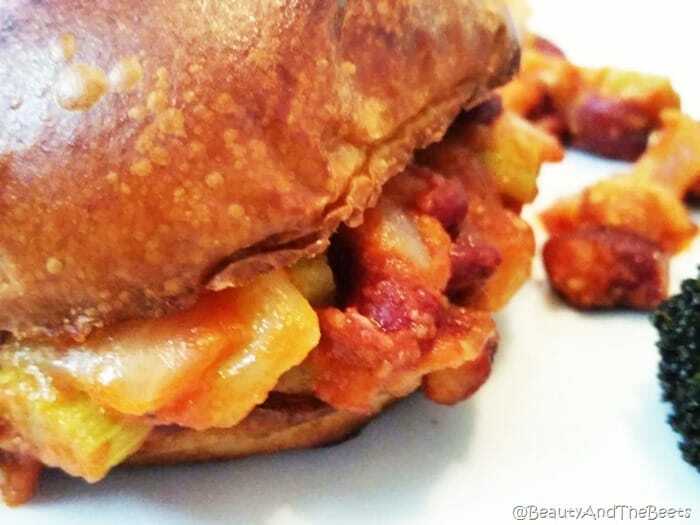 Each serving consists of one bun and about a 1/2 cup of the sloppy Joe mixture. Do you have a favorite recipe for cooking with veggies? Share your Meatless Monday recipes in the comments! I’ve never been a big fan of kidney beans, but mixed in with everything else this was pretty good.